Why is it that a broad smile is almost always wrong in a portrait? n the right above is a sketch by Sargent of Eleanor Brooks, painted near Boston in 1890, in preparation for the three-quarter-length portrait shown here. Obviously, between the sketch and the final portrait, the artist decided to eliminate the broad smile. The lady still has a pleasant expression on her face, but the smilewith teeth showinghas been replaced with an attractive, composed expression. 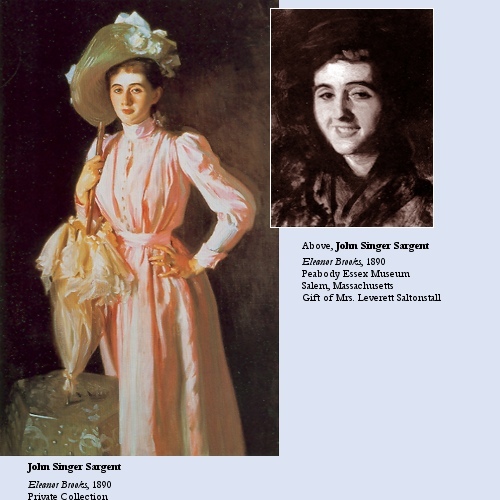 Below are details from twelve other Sargent portraits of women. Not one is smiling. In fact, a concerted and deliberate search through Sargent's oeuvre yields only a handful of portraits in which the subject has a definite smile on his or her face. The same is true of traditional, historic portraiture in general. Why is this? Why does the working portrait artist consciously feel his hand and heart restrained when the client requests a smiling portrait? I think there are four reasons, all of them potent. The first objection to broad smiles in painted portraits is simply a practical result of the fact that the standards in portraiture were firmly established in a pre-camera era. In fact, the standards for portraiture were established centuries before the invention of the camera brought with it the technical capability for capturing fleeting expressions. The portrait subject patiently enduring a two-hour sitting in the seventeenth century would not have been inclined to attempt to hold a definite expression of any kind, nor would the painter have thought of asking him to. By the time the fast-action shutter was invented in the middle of the nineteenth century, several centuries had passed since portrait painting had begun to dominate the art of picture making. The museums of the world were already filled with important examples by great artists. The 150 years that have passed since the development of action-stopping photography have not been sufficient to erase or even alter the conventions of the portrait art. The portraitwhether carved or paintedhas always been regarded as high art. At its best and most sublime (by Velazquez or Rembrandt) portrait painting has been regarded with an almost reverential admiration. "Gravitas" has been a staple of the qualities expected in a fine portrait. Flippancy and lightness are seldom qualities expected in portraiture. Hence the tendency for a portrait to be composed, restrained, and even dignified. There is however, no mistaking the fact that in the year 2009 the portrait painter goes about his ancient craft in a world that is drenched in photographyand photography in which the technical possibilities increase with every passing year. In every home, there are literally thousands of images of the people who live there. Boxes bulge with photographs by the hundreds. Computer hard drives are taxed by the sheer numbers of the images that are fed onto them. In a high percentage of these personal imagesin fact, probably in the majority of themthe subjects are smiling. I think it is fair to say that this is the standard by which household photos are judged. If the subject of a picture is broadly smiling, the picture is declared good. If a smile is missing, the picture is discarded. A group picture is considered marred by the member who fails to oblige with the expected smile. Thus, the pervasiveness of the smile in personal and domestic photography adds enormously to the pressure on the portrait painter to fall into line with the new demand for an almost universal joviality. When the portrait artist is asked to contribute his product into this environment the tension of those old seventeenth-century standards weigh heavily upon him. How to resolve this? The only thing that one can say is that everyone concerned, when the issue comes up, must realize the simple fact that the standards for candid photography and the standards for historic, traditional portraiture are different. These are different art forms, with different standards. The artist, for his part, must hasten to challenge the idea that the only alternative to a smiling expression is a sad one. This, he knows, is simply not the case at all. Between the smiling and the morose lies the broad central world of the "composed" expression. The thirteen women whose portraits by Sargent appear here exhibit "composed," non-smiling expressions. It is an unavoidable fact that the vast majority of the portraits we refer to as "great" will be found in this category. One final factor that should weigh heavily in the "smile" or "no smile" discussion is the potential for the decision to influence the monetary value of the work of art in question. Yes, I know that the most famous painting in all the world is famous for its smile. But the quality that enlivens the face of Leonardo's Mona Lisa is a very long way from a broad smile. It is the faintest of pleasant expressions. And of course the word most often applied to it is enigmatica word which carries with it the awareness that the expression on her face is very hard to read. But the point I want to make is that if Mona Lisa or Madame X or one of Rembrandt's self-portraitsif any of these featured a broad, toothy smile, the gavel price at Sotheby's would go down byI would venture to predictmany millions of dollars. So far, I have enumerated only the arguments against the use of broad smiles in classical or traditional portraiture. But are there any arguments in favor? I can think of only one, which I offer herewith with a degree of reluctance. The reader thus far may wish to protest, "But this is not the seventeenth century. It is the twenty-first, and prolonged sittings are no longer necessary or desirable." That is most certainly true. In fact, I would go so far as to agree that the most highly-prized quality in portraiture today is naturalness. Perhaps above all else the contemporary portraitist in 2009 wants the subject of his portrayal to appear relaxed, at ease and comfortable. Gone forever are the rigid, Napoleonic poses of earlier times. Today's sitter wants to be seen as affable, urbane and friendly. "Approachable" is the word that business executives use most often when describing the qualities they hope to project through my portrait of them. This over-arching desire brings with it the awareness that the pose must be natural, even casual, and the facial expression should convey warmth and friendliness. This final awareness of the expectations of contemporary people towards their own portraits must not be allowed, however, to confuse or void the timeless standards of the centuries. This calls for diplomacy on the part of the artist, and sensitivity on the part of subject and client. If the artist should find himself caught between the explicit desire of his client for a smiling portrait and his personal awareness of the wrongness of this course, one possible denouement would be to recommend that the oil portrait be displayed along with framed (and smiling) photos of the subject (the portrait on the wall, the photos on the table below). Thus the painted portrait, with its classical, composed facial expression, provides a counterpoint image to the candid photographic smile. The disparate images reveal different sides of the subject's personalityin the case of a beautiful woman, different aspects of her beauty.